Platform Tennis is an American racquet sport enjoyed by thousands of people of all ages. It is the only racquet sport that players can enjoy outdoors in cold weather. This unique appeal attracts people who desire fresh air, competition, and social engagement - all on a chilly winter's day or night. 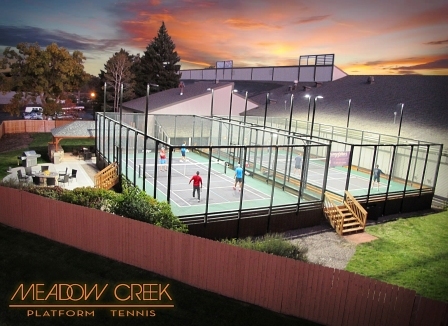 The Court: The game is played on an aluminum deck about 1/3 the size of a tennis court and is surrounded by a 12' high superstructure with taut, 16-gauge "chicken wire" fencing which allows play off the walls, as in racquetball and squash. The base of an elevated platform tennis court is enclosed, allowing for a heating system beneath the deck. The heating system melts ice off the aggregate deck surface, allowing athletes to play outdoors in all weather conditions. Our courts have lighting systems ao the game can be enjoyed day or night. Playing the Game: A picture is worth a thousands words, here for a library of videos showing platform tennis at all levels, from the recreational player to the top national players, including video instruction for the beginner. The Equipment: Platform tennis paddles are made of a composite material with aerodynamic holes drilled in the head. Paddles are approximately 18" long. The spongy, rubber ball measures 2.5" in diameter. A flocking material on its exterior keeps the ball from skidding. The Name of the Game: Players often refer to platform tennis as "paddle," as in "Are you playing paddle tonight?" More Information: Click this link to see the latest issue of Platform Tennis Magazine, the official publication of the American Platform Tennis Association, mailed five times a year during the season to all APTA members.